In English, it’s sometimes called “floating islands,” because if there’s enough of the custard in a small enough space, the meringues will float on top. If you wanted to look at it in modern culinary terms, you could think of the custard-and-meringue pair as a deconstructed meringue pie with vanilla ice cream. But that’s not this recipe. This recipe is basically a raw meringue served with cookies. But what’s surprising is that it seems to date from roughly the same period as the aforementioned œufs, the 1880s and 1890s. That does put it in the perfect time period to be paired with pineapple, which was a rare luxury stateside until steam ships started bringing them (fresh or preserved) year-round during the same decades. 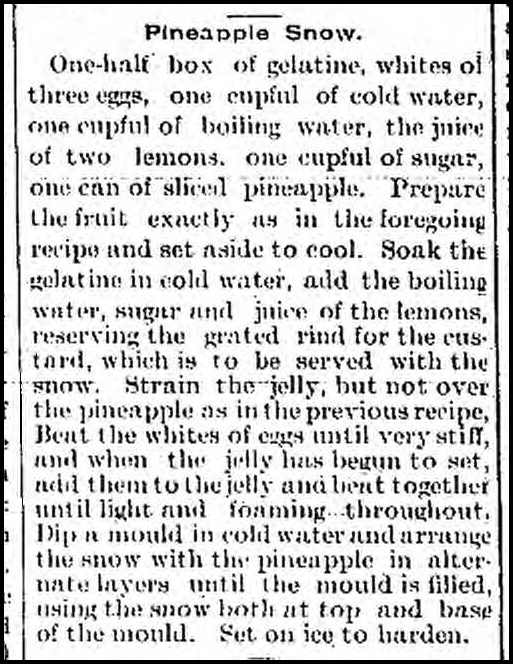 One-half box of gelatine, whites of three eggs, one cupful of cold water, one cupful of boiling water, the juice of two lemons, one cupful of sugar, one can of sliced pineapple. Prepare the fruit exactly as in the foregoing recipe and set aside to cool. 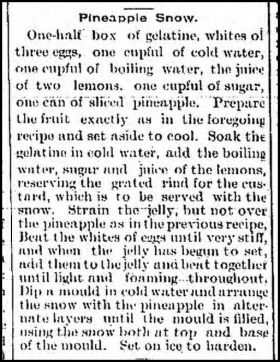 Soak the gelatine in cold water, add the boiling water, sugar and juice of the lemons, reserving the grated rind for the custard, which is to be served with the snow. Strain the jelly, but not over the pineapple as in the previous recipe. Beat the whites of eggs until very stiff, and when the jelly has begun to set, add them to the jelly and beat together until light and foaming throughout. Dip a mould in cold water and arrange the snow with the pineapple in alternate layers until the mould is filled, using the snow both at top and base of the mould. Set on ice to harden. 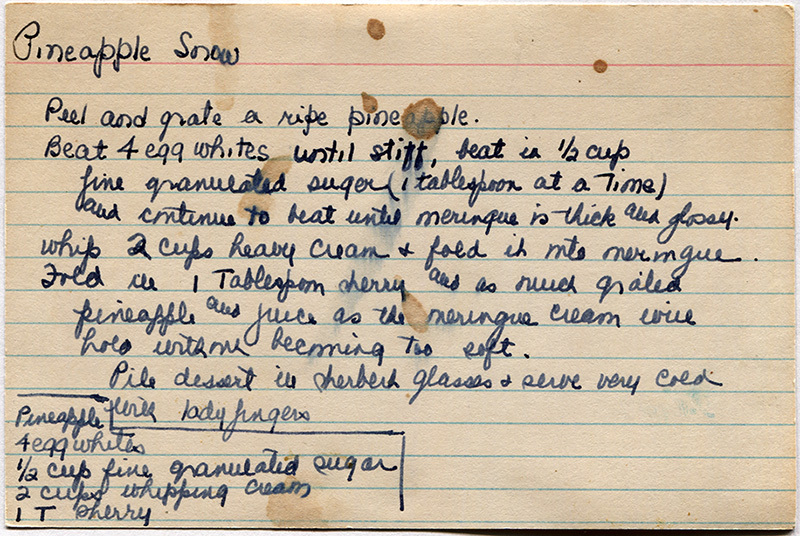 Pineapple snow — Peel and grate one small pineapple, sprinkling over it a cupful of powdered sugar as you grate it; break into this the whites of two eggs and beat all constantly for half an hour; heap this in a glass dish and pour a smooth custard around it and serve. A very delicate dessert. Peel and grate a ripe pineapple. Beat four egg whites until stiff; beat in 1/2 cup fine granulated sugar (1 Tablespoon at a time) and continue to beat until meringue is thick and glossy. Whip two cups heavy cream and fold into meringue. Fold in 1 Tablespoon sherry and as much grated pineapple and juice as the meringue cream will hold without becoming too soft. Pile dessert in sherbet glasses and serve very cold with ladyfingers. Do you have where we can subscribe to your website?